Features: 100% brand new and high quality Kindly note that it is NOT LIQUID NOR CREAM, it is solid and has to mix with PLENTY of water to get a good result. 1 x Rainbow Body Crayon. 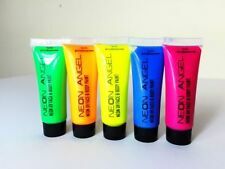 Creates a highly visible rainbow swathe of colour on your face or body which fluoresces under UV illumination. Fit the skin well and not easy to fade. It doesn't irritate the skin. How to use: Apply the brush to the paint and apply it directly to the skin after reconciliation. Colors can be overlaid. All ingredients in our Face Paints are 100% FDA compliant, non toxic. Our Face Paint kit is designed to stay on face for hours and mixed very easily with each other. Marches Events Festival Face paint. Colours may vary slightly due to the photographic process / monitor and screen settings. Easy Wash Off. Party,body painting show, bride makeup, colored drawing teaching. catwalk shows,sports painting, painting festivals, advertising gifts. 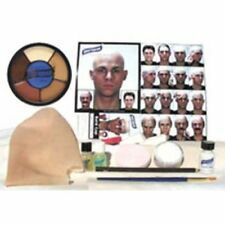 Can be used for drama, special effects makeup and body painting. Painting Fake Scar Make Up. Liquid Latex Fancy Dress Halloween FX Zombie Face. 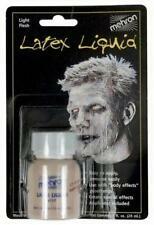 1oz bottle of liquid latex for special effect makeup and body painting. Great accessory for your trick toys. Easy And Fun to Use. Color: Red cover, White powder inside. 5ml SPIRIT GUM Adhesive 15ml RemoverSpecial FX Makeup. Our line of FX products includeScar wax, Gelatin, Liquid/paste Blood, Latex, Adhesives, Prosthetics and many more. A thick and dense formula of the classical SPIRIT GUM adhesive. This body paint is use for your face and body make-up. Turn yourself into a work of art with this body paint. Type: Body Paint. 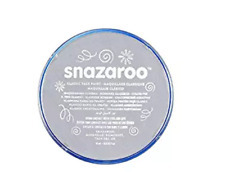 Features: Non-Toxic, Face Paint, Easy to Use, 12 in 1. 1 x Body Paint. Has the parcel been left in a secure location such as a garage, greenhouse or with a neighbour?. Our face painting stencils are made with 190 micron Mylar polyester material, which is durable and washable, yet still workable for curved surfaces. 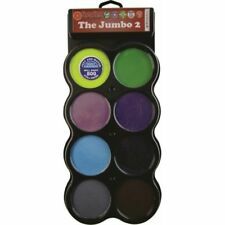 Water based face paints, easy to apply and remove; this paints is certified non-toxic and does not contain harmful chemicals. It is safe on to apply on your skin. 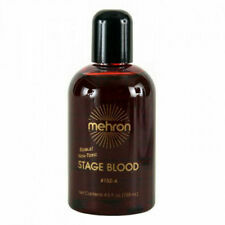 Can be used for drama, special effects makeup and body painting. PaintGlow Glow In the Dark Paint Sticks are the ideal tool for creating your individual body art. The Crayon glides onto the skin for easy free-hand designs. Stronger the light the brighter and longer lasting the glow. 1 Body Paint Set. It is safe on to apply on your skin. Water based face paints, easy to apply and remove. If you do not receive our reply within 48 hours, pls. This paints is certified non-toxic and does not contain harmful chemicals. Can be applied with a brush, sponge or an airbrush, perfect halloween makeup for all ages. ColorLight Flesh. Size4.5 oz. Professional Clown White 50ml. Solid Colour. Character Colouring Sets. Round & Square. Party Bags. Coloured Party Boxes. Face Painting. Ed's Party Pieces. Face & Body Paint by Moon Creations - 12ml - Available in 16 colours! 1Pcs x 12 Flash Colours Painting-Oil. Grease paint is kind of oil-based face painting, not water-based one. the oil face painting is easily washed off with olive oil or professional Waterproof makeup remover. This paints is certified non-toxic and does not contain harmful chemicals. 1 Body Paint Set. It is safe on to apply on your skin. Water based face paints, easy to apply and remove. If you do not receive our reply within 48 hours, pls. Halloween Face Paint Makeup Kit Fancy Dress Vampire, Devil, Zombi & Witches.